Caravan. 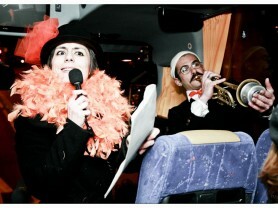 Artists on the Road (www.projectcaravan.eu) is a European project of Social and Community Theatre winner of the European cultural project for EACEA - Education Audiovisual and Culture Executive Agency in 2011. 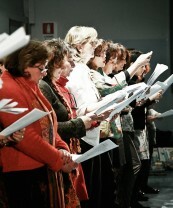 During 42 months it has created innovative artistic and theatrical actions on the topic: reviving from the crisis. Thanks to a travelling theatre - the CARAVAN - the project realised more than 40 European events bringing together art, theatre and community; it crossed 15 nations, with the partnership of 11 international partners. Caravan met more than 60.000 spectators, 8.000 active participants; it served as a co-operation place for almost 200 artists and theatre professionals; it created local networks by developping connections among associations, spontaneous groups, volunteers networks, institutions, professionals and citizens. Caravan. 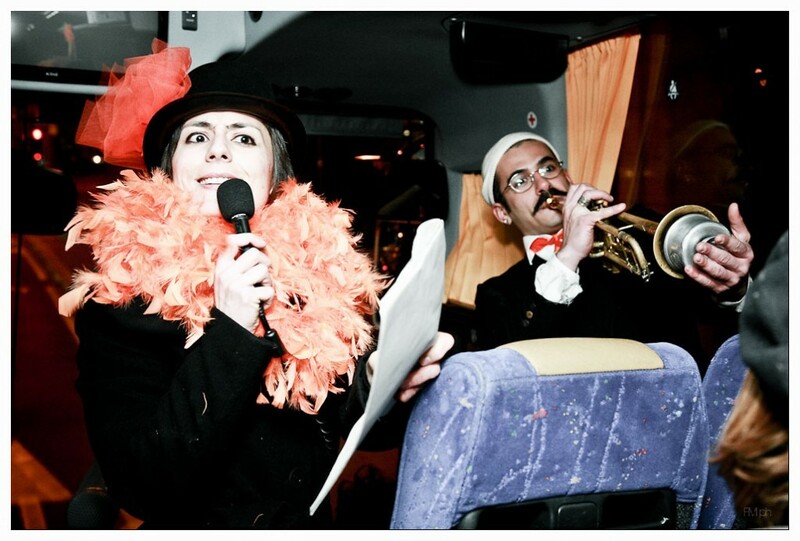 Artists on the Road (www.projectcaravan.eu) is a European project of Social and Community Theatre winner of the European cultural project for EACEA – Education Audiovisual and Culture Executive Agency in 2011. During 42 months it has created innovative artistic and theatrical actions on the topic: reviving from the crisis. Thanks to a travelling theatre – the CARAVAN – the project realised more than 40 European events bringing together art, theatre and community; it crossed 15 nations, with the partnership of 11 international partners. Caravan met more than 60.000 spectators, 8.000 active participants; it served as a co-operation place for almost 200 artists and theatre professionals; it created local networks by developping connections among associations, spontaneous groups, volunteers networks, institutions, professionals and citizens. During these three years and a half, professionals working in the Caravan project have exchanged artistic languages and experiences, have created new co-operation networks and, most of all, they have written down a “Cultural Manifesto” for the development of Social and Community Theatre in Europe. In October 2010 the project Caravan was presented to the Culture Programme 2007-2013, under the Strand 1.1 “multi-annualcooperationproject” and in March 2011 it gained a European match-fund as it was placed first among 61 projects eligible for the final selection, with a score of 99/100. It was the only Italian project to be awarded. The Italian Contact Point of the Programma Cultura (within the MiBAC – Ministero dei beni e delle attività culturali) defined it as an Italian standard of excellence in Europe. The project originates from the context of economic, social and cultural crises that impacts on the society across Europe. It intends to build up the topic of reviving from crises through cultural interventions and artistic performances based on the Social and Community Theatre methodology, with the aim of boosting the cultural and social empowerment of local communities in some symbolic places of crises. The project Caravan is envisaged to carry out community interventions in 4 “places of crises & renaissance” located in 4 different European cities (Turin, Sevilla, Holstebro, Sofia), where 4 groups of artists created respectively 4 artistic community events and 4 theatre productions. In addition, the project developped an itinerant Caravan Theatre, i.e. a vehicle equipped with multimedia artistic fittings, with the aim of touring throughout Europe and circulating the aforesaid theatre productions. In order to disseminate the results and best practices achieved during the project Caravan, 10 conferences/seminars were organised in 10 European cities. A documentary film and other audio-video materials were produced, as well as printed publications. A travelling stage is the itinerant symbol of the project: the CARAVAN is a multimodal state-of-the-art vehicle, which combines traditional theatre languages with innovative techniques and technology. It is also able to create a mix of arts and new ways to welcome the audience. This vehicle can effectively change into a real stage, open-air cinema, exhibition locations. The project Caravan has been awarded by EACEA for the innovative approach and the methodology it has used. In 2010 it foresaw the guidelines for interventions, later established within Creative Europe.